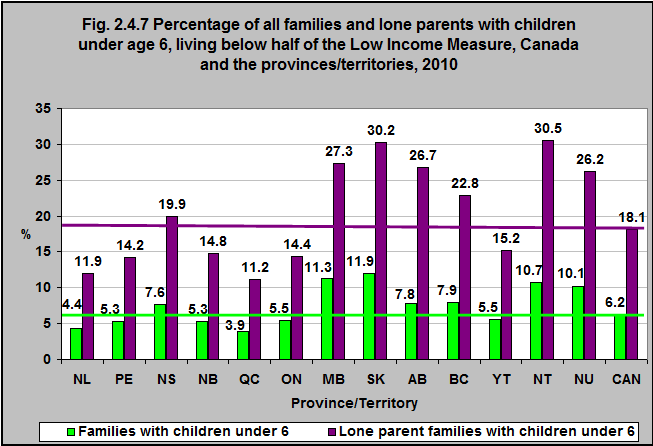 Source: CICH graphic created using a Statistics Canada custom data run of Taxfiler variables relating to families with children under 6 for each province and territory, 2010. 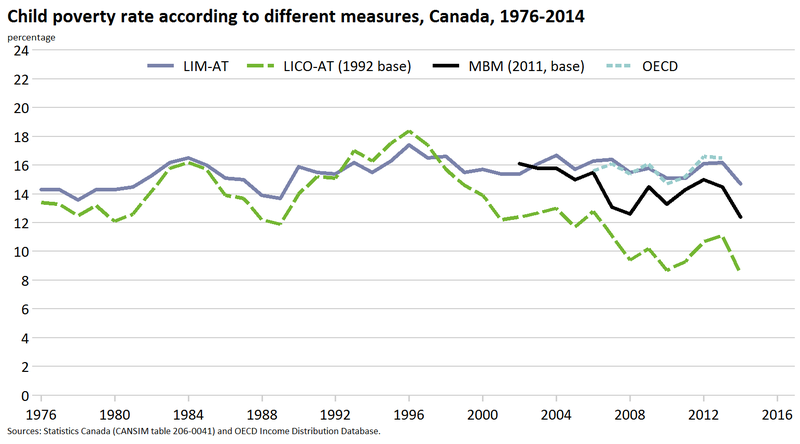 In 2010, 6.2% of all Canadian families with children under 6 were living in deep poverty – that is they were living with incomes less than half of the Low Income Measure (LIM)*. That proportion was three times higher for lone parent families – at 18%. There were provincial and territorial variations in these rates. Among all families with children under 6, Manitoba and Saskatchewan had the highest rates of deep poverty – at 11% and 12% respectively. The lowest rates were in Québec and Newfoundland & Labrador at 4%. The highest rates of lone-parent families living below half of the LIM were in the Northwest Territories (31%) and Saskatchewan (30%) and the lowest rates were in Québec (11%) and Newfoundland & Labrador (12%). For the purposes of this module the LIM was used. Please click here to review a report that compares the LICO, LIM and Market Basket Measure.